and prevent it from re-depositing (*2). 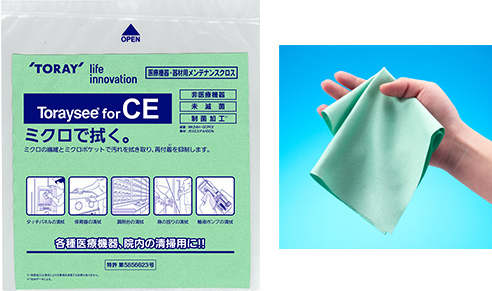 Toray's proprietary "micro-pocket effect" wipes up dirt and prevents it from re-depositing on the surface. Toraysee™’s ultra-fine fibers (approx. 2 µm) adhere to the surface being wiped, scoop up the dirt and trap it in the "micro-pockets" (minute gaps between the fibers). This gives Toraysee™ excellent wiping performance (trapping function). ※1 Microbial-control treated cloths will not disinfect surfaces being wiped. ※2 According to Toray data. 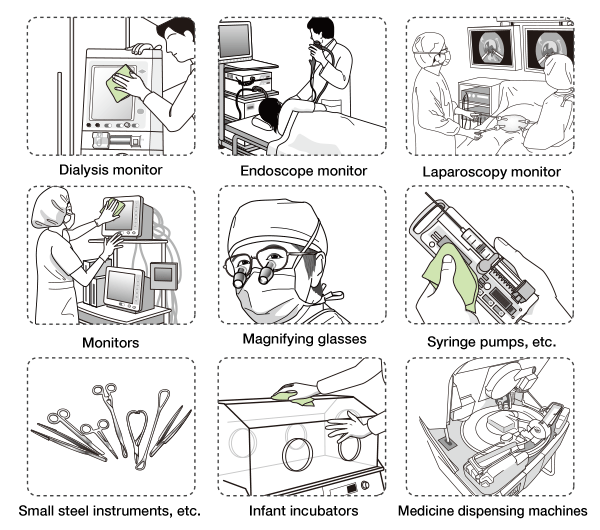 In the cleaning of medical equipment and instruments, priority is given to the "washing" process (removal of organic materials and dirt). 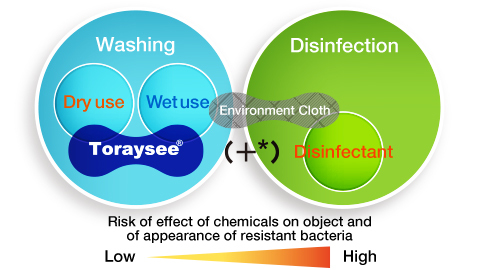 Toraysee™ is a cloth that specializes the removal of organic materials and other dirt and washing without the use of chemicals. It can be used wet or dry according to requirements, and can also be impregnated with disinfectant. *Toraysee™ can be impregnated with disinfectant as required. 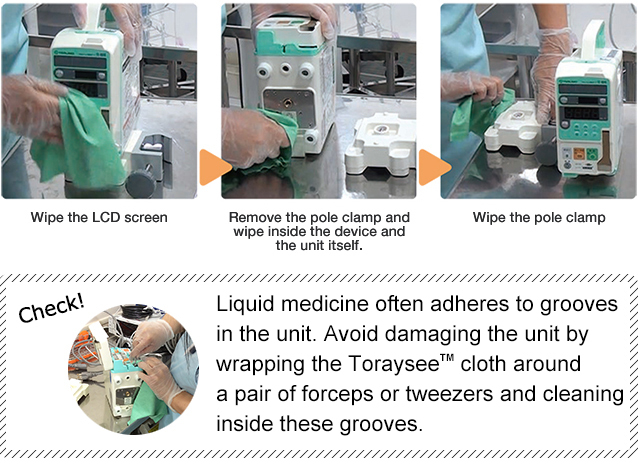 If using Toraysee™ for the purpose of disinfection, be sure to use an appropriate disinfectant for the object being disinfected. Wet use has a 10 times greater cleaning effect than dry use! Suitable for daily maintenance in a range of applications, such as hospital equipment, monitors, medicine dispensing machines, etc. Microbial-control treatment is a treatment that aims to control microbial growth on the cloth’s fibers. Compared to ordinary treatment, in which the microbial-control agent adheres to the outside of the fibers, with Toray’s microbial-control treatment (Makspec®), the microbial-control agent infiltrates the fibers, thus sustaining the microbial-control effect. This product has been confirmed to be unaffected when immersed in disinfectants etc. containing the following ingredients at the following concentrations for about 10 minutes. Do not use on the human body. Do not use on aseptic or sterile surfaces. Microbial-control treated cloths will not disinfect surfaces being wiped. If using this product for the purpose of disinfection, be sure to use an appropriate disinfectant for the object being disinfected. When using this product in hospitals, etc., assess the risks of transmission of microbes onto the object being cleaned and impregnate the product with a suitable disinfectant as required. Also, regarding the timing and method of disposal of this product after use, assess the risk of infection and dispose of it by the appropriate method in accordance with the facility’s rules and regulations. If you intend to wash and re-use this product, disinfect the product as appropriate by impregnating it with a disinfectant or by other appropriate means.